‘Off the beaten track’ — if only! Years of travel have made me long for exotic spots, places at the edge of the wilderness, where one might find a few creature comforts along with a chance to discover something new about human nature. Can such longings ever be satisfied? I found the answer recently, on a trip to the Nilgiri Mountains of southern India. I went there with only the vaguest of expectations — glorious days hiking in verdant meadows at above 8,000 feet, and long nights by the fireplace, Kingfisher beer at hand, falling asleep over books of ancient travels that would wend their way into my dreams. It did not quite turn out as planned. An encounter with a tribal people resulted in one of the most memorable trips in recent years. 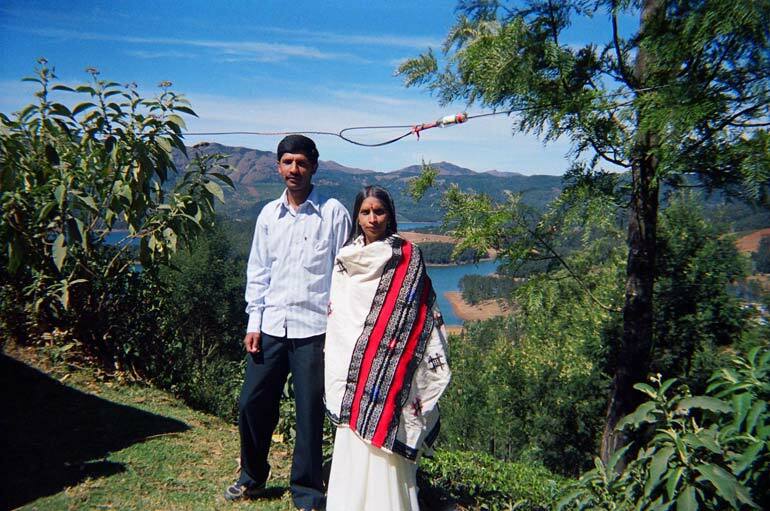 I arrived in Ooty in early January, fresh from a foray in Sri Lanka. 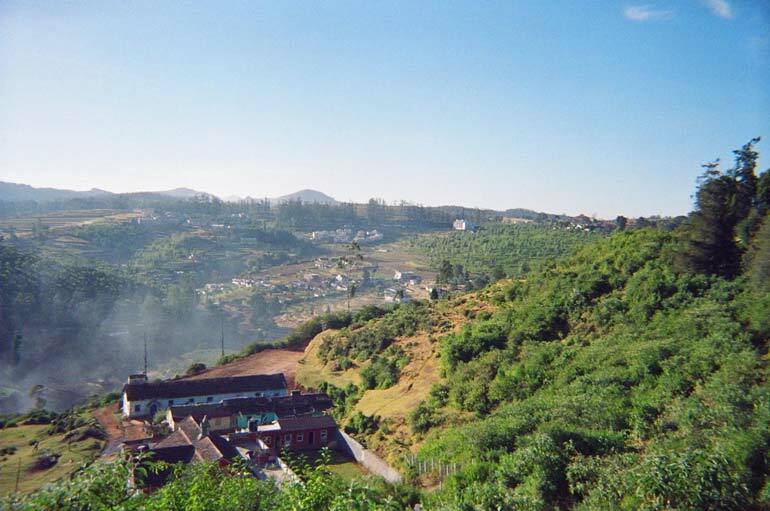 Ooty, the British contraction for Udhagamandalam, is a hill-station set on a high plateau amid spectacular mountain ranges. To get there, I took a bus from the city of Mysore, a ‘Deluxe Coach’ that teetered to one side as it bumped along through the dry jungle of the Bandipur and Mudumalai game sanctuaries. The trip was not without its rewards; at one point, as the driver stopped to pay toll, a young Nilgiri Langur (Trachypithecus johnii) leaped onto the steering wheel, its dark eyes alert and shining, its spiky white mane giving it a strangely punk look. People feverishly snapped pictures, but then the driver swatted at it with a film magazine, and the disappointed creature bounded out of the window into the forest. As the bus began its climb up into the Western Ghats, wheezing and bumping up along the hairpin bends, the forest gave way to grand escarpments rising out of the shimmering plain, their sides clothed in a mantle of evergreen forests. The furrowed slopes of tea-estates started to appear, and then close-ups of women plucking tea, and small vegetable farms with men standing in the fading sunlight tending their carrot patches. In the tiny villages perched on the edge of the terraced hillsides, barefoot children ran alongside the bus, waving their cricket bats at us. We passed young women walking carefully in flashy slippers, baskets of produce perched delicately on their heads, and young men holding hands and waving. From the Ooty bus-stand, an auto-rickshaw took me across a rather tentative road to my hotel, the Regency Villas. The hotel sits on Fern Hill, the estate of the Summer Palace of the Maharaja of Mysore. 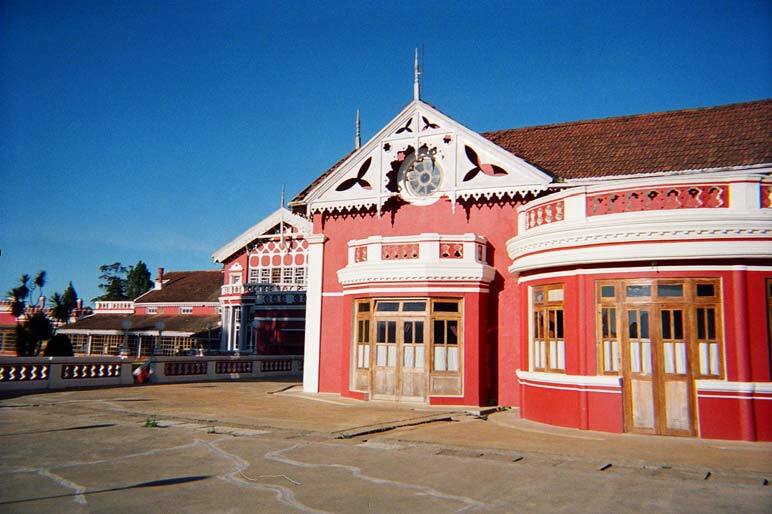 The cottages, all painted in pink, are refurbished hunting lodges from the days of the Raj. The walls come adorned with faded photographs of Mysore royalty gathering on the premises in Victorian times, posing next to slain lions and Englishmen in solar topees. I fell asleep wondering which visitor had slept in my creaky cot a hundred or more years earlier. 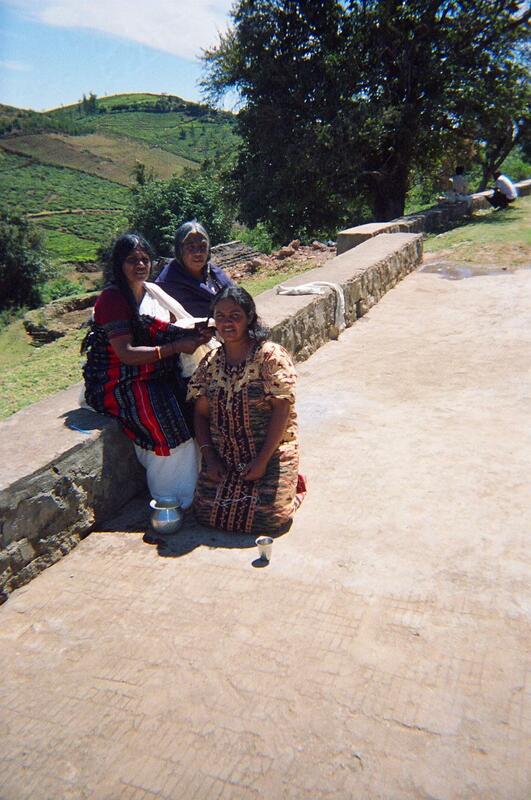 The Nilgiris, I knew, were home to a number of hill tribes, including the Todas, who, I had been informed, practiced polyandry, and also the Kurumbas, who were sorcerers. 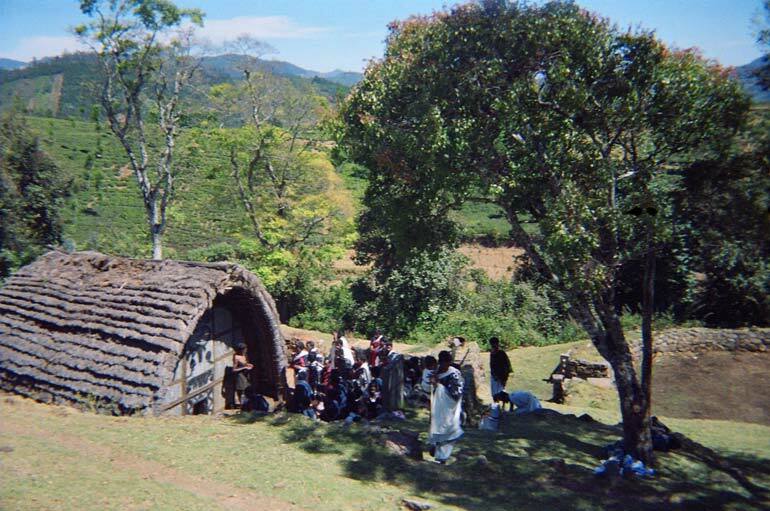 To find out more, I caught a bus to the Tribal Research Center, on the road to Mount Palada. At the Center, I found a number of model huts, sparse but carefully maintained, along with a few tawdry stuffed birds, spears, and hundreds of botanical specimens in small labeled bottles, presumably the sorcerer’s materia medica. The Director, Dr. Jakka Parthasarthy, apologized for the poor condition of his museum, a result of a lack of government funding. He told me that polyandry among the Toda was rare these days, and that their practice of infanticide and the ritual deflowering of maidens were long extinct. Kash mand was a mand, a little Toda hamlet of huts and one-room houses, along with a well and a tethered long-horned buffalo. It sat quietly, this ancient hamlet, behind the forbidding wall of the vacation home of Vinod Mallya, the plutocrat responsible for Kingfisher Beer and now Kingfisher Airlines. Mrs. Vasamalli, a middle-aged lady in a white sari, was lighting little clay lamps outside her tiny residence as a gesture of farewell to the sun. 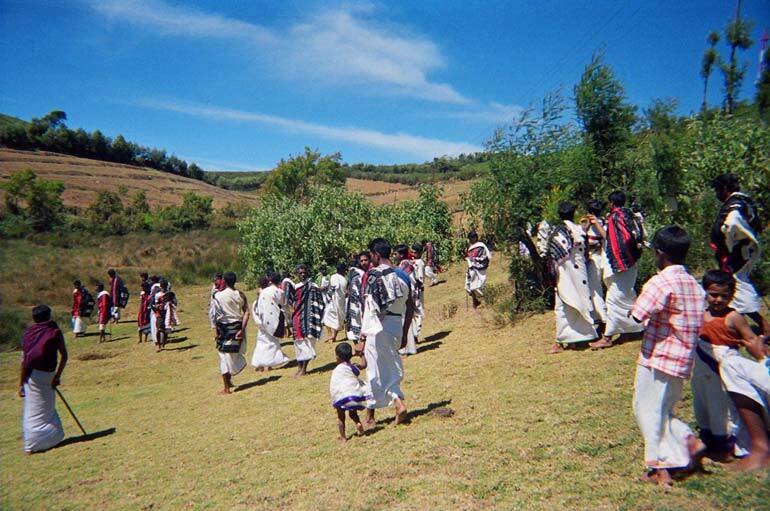 She explained that the word “Toda” was derived from the word “Tud” in the Toda language, meaning “sacred tree”. A young man walked in. He was tall, with a smooth, angular face, and a look of refinement and quiet dignity. “This is my eldest son Ponnian,” she said. As they spoke to each other in Toda, I heard a variety of wet sibilant sounds and tongue-twisting ‘r’s, spoken with an almost recitative formality. “He’s sweaty because he’s come straight from the golf course,” she said, ruffling his hair. She explained that Ponnian had started out as a caddy several years earlier at the Ooty Golf Club at Wenlock Downs. He was now a scratch golfer, given free clubs and access to a trainer, and was now by far the best player in the southern region. Ponnian had recently graduated from college. He told me he was hoping his degree, golfing skills and other athletic achievements (he was also a marathoner) would help him get a job in the Army. We set out around eight in the morning, driving in a Mahindra Jeep towards Emerald. The road circled lazily around a tea-estate, swung through valleys speckled with yellow gorse, and then climbed up through a region of dense eucalyptus groves. “This is just great!” I said, inhaling the scent of eucalyptus through the open window. I spotted a massive peak, tinged with blue shadows, with two smaller siblings nestling on each side. Between them, valleys shimmered into the distance. “The souls of the buffalo go into one valley, those of humans into the other,” Mrs. Vasamalli said quietly. “We don’t have the right to visit most of our sacred places,” Ponnian said. The road ended at the bottom of a hill, and we had to trek up the last mile, climbing a steep and grassy slope. At the top was a mand consisting of a row of eight tiny brick houses, built above a brook. I could see an ancient barrel-vaulted dairy temple below, made of bamboo and mountain grass. It was an extremely modest structure, but Ponnian had told me how, to keep them in good repair, he and his mates had walked fifty miles to find the increasingly rare variety of mountain grass. were nearly a hundred of them in their shawls, lean and tall, striding purposefully towards the pond. The buffalos drank greedily. After they were done, each of the Todas cupped his hand in the water, and poured it into his mouth. Outside the mand, a crowd of small children came running out in their Sunday best, followed by a crowd of rather striking Toda women, all with striking looks and long tresses. One of them sat down to get her hair braided. The men meanwhile gathered by the dairy temple, in front of a bare-chested priest. After a short ceremony, they drank freshly churned buffalo buttermilk, served by the priest in small leaf cups. One of the men brought it over. It tasted pretty good, but then I am fond of buttermilk. The men began dancing, a slow rotation with much banging of staves and cries of the sacred syllable “Ho”. As they danced, a pair of gorgeous flycatchers flitting above them, the Todas seemed to be part of an ancient pattern, one with the trees and mountains and the eternal sky. Meanwhile, the women had started their own dance, with Mrs. Vasamalli leading the way, singing a playful song that invited a dear but reluctant buffalo to come and drink. I tapped my feet but did not join in, for I was guzzling on wild honey, fresh off the comb. Before shoving a slab of the sticky mess into my mouth, I was instructed to place a dollop of honey on my forehead, as a mark of respect to the bee. The dancing went on for several hours, and was followed by a lavish vegetarian feast, served to me inside one of the houses, which, I noticed, was spotlessly clean. I ate heartily, grateful to the women who, I knew, had to fetch water all the way from a stream. After the meal, the men sat under the trees, smoking and conversing of tribal matters, while the women stayed inside and caught up on family gossip. A child came up to me and taught me the basics of counting in Toda. There are many other enjoyable things to do in Ooty, including visiting the Botanical Gardens, which even in winter boasts a marvelous collection of hundreds of rare orchids. Outside the Botanical Gardens, I ran into another threatened culture at the Tibetan market, run by refugees from the giant settlement of Kushalnagar, in the Indian state of Karnataka. I had a wonderful time drinking tea with them and talking about the Dalai Lama, who had honored Kushalnagar with a visit a few weeks earlier. Other activities I recommend include trekking, visiting the old British graveyard in St. Stephen’s Church, browsing the Victorian fiction in the cavernous Nilgiri Library, and dining on fine Indian and international cuisine at the Savoy Hotel and the Holiday Inn. And if you happen to go there, like I did, in the winter, to hike in verdant meadows and to read a tale of faraway travel by the fireplace, a Kingfisher or warm brandy in hand, please do give a thought to the Todas, who have been trying ever so hard to preserve their natural way of life amid the hubbub of modern India.